"Resolute is not the end of the world, but you can see it from here." That's how the saying goes in Canada's second most northern community Resolute Bay. 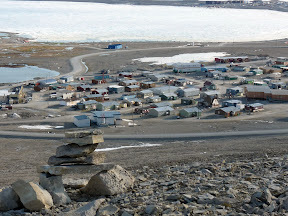 The town of approximately 260 people rests on the south coast of Cornwallis Island, just to the west of Devon Island, where FMARS is located. It takes its names from the ship HMS Resolute, which was stranded in the ice here in 1854. Later, an American whaling ship found the Resolute adrift near Baffin Island and towed it back to Queen Victoria in England. She then had a desk fashioned from the ship's timbers and gave it to President Hayes in 1880, and to this day most US Presidents have used that desk in the Oval Office or their private study. 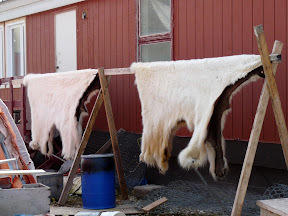 Below are some pictures from around town showing polar bear skins, Arctic char drying in the sun, and the South Camp Inn where I am staying. I've spent the past two days here in Resolute acclimating to to the arctic climate, collecting all of the shipments that we've sent up here, checking out gear, and generally preparing for the expedition. I've collected boxes and shipments from far-flung corners of the town, staged them into lots for the Twin Otter flights, tested communication equipment, and I even squeezed in time for some blogging and hiking. 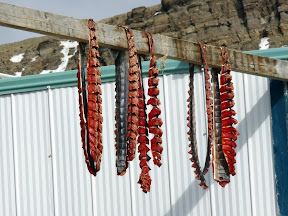 Later in this post, I'll share some pictures from around Resolute Bay. 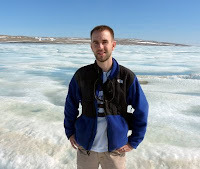 The one here shows me standing on the ice covering Resolute Bay itself. I'm struck by how similar this community is to McMurdo Station, Antarctica. They're both at similar latitudes, both support a wide array of scientific activities, both have a very industrial/utilitarian feel, and the people are mostly hardy laborers and migratory scientists. The main difference is that McMurdo is about 10x bigger in terms of population during the summer field season. 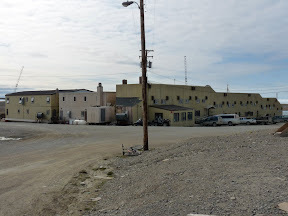 For another really good account of life in Resolute Bay, check out this descriptive post by Ottawa Beige. For a first-hand account of life here from a local resident, check out this YouTube film about Resolute Bay. As promised, here are some pictures from around Resolute Bay. 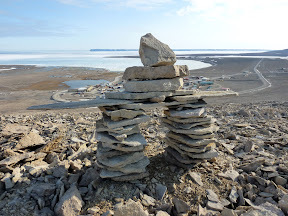 The first row features Inukshuk overlooking Resolute Bay, and after that is a panorama of the view looking west. More pictures are online at the FMARS2009Crew Picasa Web Albums site. Four of the five remaining FMARS crew members arrived here in Resolute Bay this evening, and we had a productive planning session covering safety, environmental impact, and how to partition our gear on the flights. I leave for Devon Island tomorrow, and it might take a few days for me to establish an internet link and write another blog post. Stay tuned for my next dispatch from FMARS! Sounds like a great time and experience Brian! I'm looking forward to following you on this adventure. 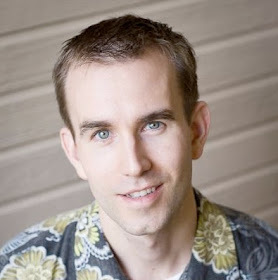 Thanks for taking the time to blog about it! Great pictures. I read 'Driving to Mars' with great interest. Now, it's like I've got pictures of what he was talking about. Hi, KD5NJR. If you like "Driving to Mars", check out "Mars on Earth." It's all about this particular Mars simulation project on Devon Island.